The story of this picture, which is just a few of my kids’ toys on the living room floor in the wee hours of the morning, begins with this talk by National Geographic photographer Sam Abell. In it he discusses, among other things, the process through which he created one of his most famous pictures, Pears in Window, Moscow. His presentation is kind of long but well worth your time if you have an interest in learning more about photographic composition, and one thing he discusses is composing your pictures in such a way that all the elements (foreground, subject, and background) all come together to form a cohesive whole. 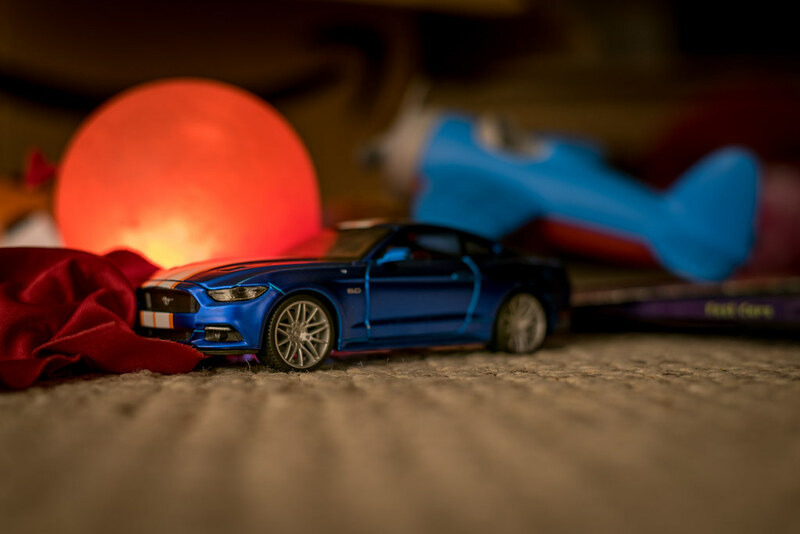 Now, this picture of a toy car is so far from one of Sam Abell’s masterpieces that the two hardly seem worth mentioning in the same blog post, much less the same paragraph. Nevertheless I did use a bit of what I learned from Mr. Abell when I made this image so I thought I’d share it here. I took this picture on a Tuesday morning before my kids were up and I just wanted to use my camera. I got out my D750 + 50mm combination and went around the house taking pictures of anything I could find, like a bottle of olive oil, some cups on the table, or a paintbrush that had been cleaned the previous evening. I didn’t think about whether something would make for a good picture, but instead just focused on using my camera to make some images and if I didn’t like them I’d just delete them. 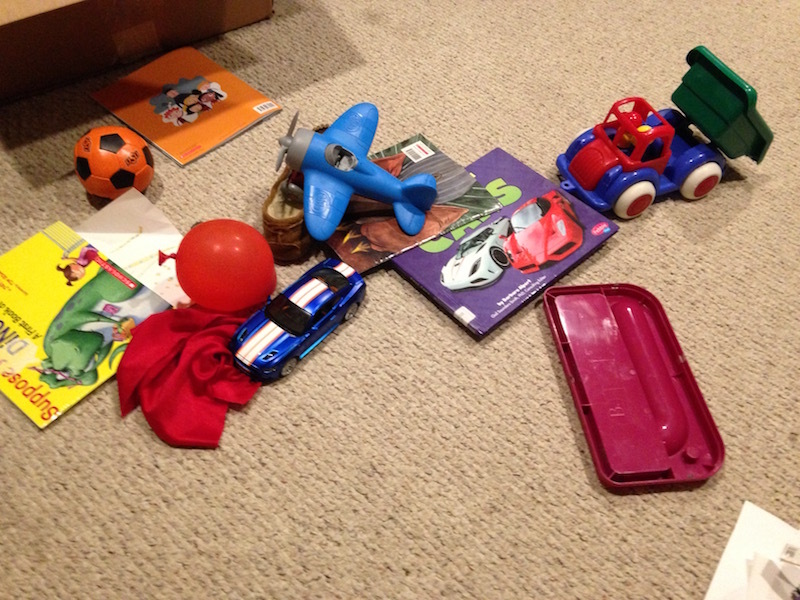 After a little while I came across this blue car on the floor surrounded by a balloon, airplane, and other sundry items which made me stop and think a bit about what I learned from Sam Abell. Same scene as above, but with the lights on. The result is not a special picture in and of itself, but instead it was the process of taking the picture that meant something to me and is the reason I’m sharing it here. It represents another footstep on the never-ending path of learning photography, and I hope will help inform how I approach other pictures from here on out. One of the best blogs posted in this series. I have already signed up for the Nat. Geog offer. Hi Simon, I’ve just joined your blog and look forward to seeing more photos. I really like this pic. I enjoy still life because it’s very creative and I like reading about your process. Welcome aboard Andrew, and thanks for reading. Do you do any still life photography of your own? If so I’d love to see some of your work. I, too, was privileged to her Sam Abell speak and his theme of “compose and wait” has been in my head ever since. Thank you for posting how you made the connection between his process and real life. Very instructive today! You amaze me with your ability to take ordinary objects/situations and convert them into memorable photographs. I understand that the theme of “compose and wait” is a principle we should keep in mind. I have listened to about a 1/3 of the interview with Sam Abell. I agree that it is something all aspiring photographers should listen to. Thank you for giving us some of the mechanics of how you set up and composed the shot (hmmm… combined with last week’s blog, you are starting to get pretty instructive!). I will make a renewed effort to consider composition in my photos this week. Love this post… I’m a new follower and happen to be a toy photographer so this one definitely got my attention. Nice work love the focus and setup. I’ll be checking out the Sam Abell video a bit later, I need to slow down and be patient when photographing. I love the idea of the flashlight behind the balloon and how the objects in the photo are composed. Simple things that probably remind you of your children and are a part of your life. Very sweet! Thank you Yvonne! The flashlight behind the balloon was kind of a spur-of-the-moment idea and looking back on it I think there are a few ways I could have done this differently but I do like the overall effect. And you’re right, scenes like this sure do remind me of my children! Hi Simon, I think I am going to be regular here! I chanced upon your blog through your article in dps. This article is very instructive and inspiring especially for someone new to photography like me. How you got such a great picture out of the ordinary is simply amazing. Thanks for sharing. I’ve been a follower of your blog for a while. The word “mustang” always gets my attention. It could be one of two things, my favorite car or a beautiful horse. Also, the little plane in the background because I bought one of those for my grandson a few years ago. Thank you so much for sharing the video of Sam Abell. I watched it this afternoon. Like all National Geographic photographers, he is amazing. I picked up several tips from his talk today. I’m always aware of the backgrounds in the images I’m creating, but with sports photography, which is what I do the most, you sometimes can’t control it. He had so many useful tips that I took notes. I’ve also read most of your tutorials on DPS. I think it’s cool that someone from Oklahoma posts on there. DPS has helped me tremendously with my photography. I’m so glad DPS has helped you over the years! Darlene and Darren, the people who run that site, sure do a good job with keeping informative content coming on a regular basis.